As you know by now, if you read my blog, Linda and I went fishing in Idaho a week or so ago. Last week I talked about the beauties of fishing in The Wood River valley and on the Lost River near Mackay, ID. This week I thought I’d write about the art of angling itself. And angling is an art. 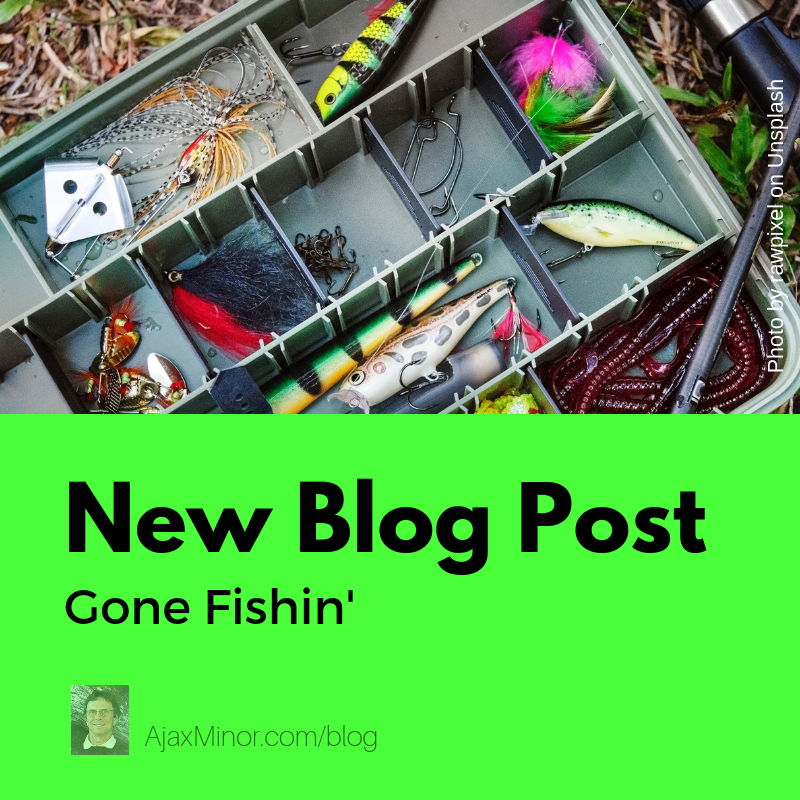 One has to know WHERE the fish are, or ‘hold’, when they might be HUNGRY, or ‘on’, what flies or lures might attract them, or ‘matching the hatch’, how to CAST accurately…Well the list goes on. I’ve been fishing as long as I can remember. As a young child my dad and I fished Lake Candlewood near my hometown of Danbury, CT. We fished from a boat and used spin casting gear, consisting of a reel with a crank and a ‘bail’, to allow the monofilament line to release when casting and closed to provide tension when bringing in a fish. Exciting stuff, huh? Usually the lure is cast sidearm. But it’s important to know WHERE to cast. Often into grass, lily pads or around rocks. One has to take care not to get hung up. But the time and patience were worth the effort when we landed fish. One of my best memories is of landing small sunfish, fileting them and cooking them in butter right there on the boat! I think though that my favorite time to lake fish was early morning. Often the surface of the lake is, quite literally, as smooth as when the first thin sheet of ice covers the water in early winter. On cooler mornings the water might be covered with a light fog, making the experience, around dawn, magical. Later, as a teen, I fished the ocean. My dad had a seasonal business so we would pack up and head to the Florida Keys for a month (my teachers were understanding and I did my work in the car!). We would fish either on the Florida Bay side, to the west of the keys, or on the ocean side to the east. Radically different environments. The Bay, which is part of the Gulf of Mexico, was very shallow west of the Keys and the fish, Spanish Mackerel, Weakfish and Snapper were all small enough to be caught with light spinning gear, as you would use on a lake. Especially enchanting was fishing around the Mangroves, which grew in the salt water and harbored nice fish. I always felt like an explorer when we moved through the Mangroves and thought of books like Hemingway’s ‘Islands in the Stream’. Speaking of ‘the Stream’, we would fish in the Gulf Stream, about seven miles off shore to the east, for sailfish and dolphin. It was truly amazing to actually ‘see’ the Stream, a dark blue expanse of water that cut a line right through the ocean, the demarcation being between the shallower green water and the Stream, where the depth plunged from one hundred to six hundred feet. We would also ‘troll’ around Sombrero lighthouse, which was a perfect environment for ‘reef fish’: barracuda, tuna and amberjack. And man do ocean fish fight! They are stronger than their fresh water counterparts, as the sea is a more abundant food source and because currents make the fish more ‘muscular’. I guess it’s like spending twenty four hours a day in the gym! You might think it boring to sit in a lawn chair at the stern of the boat and drag your bait behind you. But the rolling waves, slapping you with salt spray when the wind gusted, and the sun and the smell of the sea were deeply invigorating. One word of caution if you do go deep sea fishing: if you get a touch of seasickness make sure to sit on the ‘lee’ side of the boat. That is, downwind. Quite the mess if you lose your breakfast to windward! The only good thing I can say about seasickness is that once you place one foot on shore it goes away. Fortunately I learned early to avoid greasy bacon for breakfast! I’d planned on talking about fly fishing as well but I’d expect you’re about worn out at this point. We’ll save that for my next Blog. I will be back in Connecticut next week for a 50th (no way!) high school reunion next week, so my brilliant Social Media Guru, Evelyn Helminen, will be posting some earlier material. See you in a couple!